The Australian made horror short She's Having a Baby! 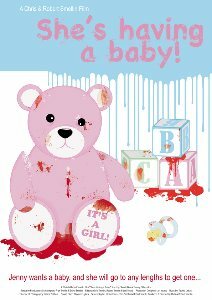 is a creepy and effective 15-minute thriller centered around one woman, Jenny (Wendy Bos), who wants a baby and willgo to any lengths to get one. That doesn't exactly make things look promising for Simon (Tommy Clifopoulos), a seemingly ordinary joe who has become inexplicably bound to Jenny's disturbing little plan. Co-directed by Chris and Robert Smellin, She's Having a Baby! has already screened at over a dozen fests while picking up prizes at WorldFest Houston (Silver Remi Award for Best Suspense/Thriller), Melbourne Underground Film Festival (Winner, Best Director and Nominated, Best Short Film), and Louisville Fright Night Film Fest (Honorable Mention). The film's greatest strength is the performance of Wendy Bos as Jenny, a woman who is simultaneously creepy and disturbing yet, almost unfathomably, also rather sympathetic. Bos infuses Jenny with a rather soulful ache that leaves you fascinated with the character even as you're sitting there watching the screen wondering exactly what she's going to do next. While he's given considerably less to do, Tommy Clifopoulos also does a nice job as Simon. Lori Young's production design is top notch, no small challenge given the film's weaving together of a disturbing world within a skewed maternal universe. James Beilharz's lensing is given time to linger despite the fact that the film runs a rather slight 15-minutes. Where She's Having a Baby! really works is in the fact that it avoids force-feeding its opinion of the characters on the unknowing audience and, instead, allows us to play observer and draw our own conclusions. She's Having a Baby! continues on the film festival circuit and if you get a chance it's a terrific view for those who prefer their suspenseful thrills on the more vulnerable side of life.